After the man left, the room had grown cold. Ernst had long since realized that the fire in the hearth had gone out. Shivering from the extreme cold, Ernst curled up his quaking, trembling body within the cold bedding. Even though Ernst had submerged himself in blankets, sleep never came for him. Morning eventually came, and Ernst hadn’t even gotten a wink of sleep. Seeing that the candles and firewood had burnt themselves out, the butler turned a condemning glance on Ernst. With his head fuzzy from a lack of sleep, Ernst ate his breakfast, which was the same food as yesterday. In his office, Ernst cast his eyes over some of the documents that the head butler had gathered. The number of villages in Meissen, the number of towns, their population, demographics, militia count, the resources within the fief, the resources they imported from other territories, the number of livestock, the acreage of farmland, the rate of usage. The relationship with the neighboring Lux Kingdom, the relationship with Grude Continent, the previous Lord’s reign. There was no end to the things he had to know, and even if he did learn them all, there was still more to come. Yet not a single thing stuck in Ernst’s mind. It wasn’t because of his lack of sleep. Even Ernst knew that. Last night, what was that man saying? Ernst had deliberated over the meaning of what that man had told him all through the night. Loved him to the bottom of his heart. Loved him. L, o, v, e.
Ernst now noticed that the concept of ‘loving a person’ was a gaping wide blank in his understanding. After all, he had been the crown prince. For sixty years since his birth, up until a few months ago, he had been the crown prince. This wasn’t an existence where he could frivolously fall in love, and the partner whom Ernst was to love was to be some powerful noble’s daughter, as decided by the leaders of the Kingdom. It was an existence where, regardless of Ernst’s wishes, he would have to usher in several people as his consorts. Ernst’s circumstances had nothing to do with falling in love with anyone. That was how it was supposed to be. Ernst himself had thought that this was how it should be. What type of feeling was it, to fall in love? All throughout the night, he had thought this over. Even now, while he was looking through the information on his territory, most of his head was filled with that matter. The head butler, the butlers, the maids, and the royal guard, all of them were ‘things’. They were the same as the desk, same as the chair, same as the walls, same as the pillars. Even if the person were replaced, nothing would change except for the face; it was no different from re-upholstering the back of a chair. It was for this reason that Ernst never asked for anyone’s name. He had looked at them the same way he looked at objects. The ambassadors from other countries who had come to visit the royal palace were also ‘things’. There was no difference between anyone or anything. Ernst, who couldn’t discern people from objects, let alone pick out individual people, couldn’t possibly do something like fall in love. From now on, he was free. He wasn’t royalty; he was going to live as just any other noble now. Ernst could now choose his own partner to love at his own discretion. In that case, he considered. Do I fall in love with that man? He had never considered something like taking a man as his partner. It couldn’t be helped. He had been royalty, after all. That was something who had to leave behind a child no matter what. That wouldn’t be possible if his partner were a man. But from now on, he was free. In the first place, the races of Schell continent lived longer lives than races from other continents, so they didn’t find much worth in having children. Marriage itself involved a painstaking exchange of contracts, and only royalty and nobles bothered to go through with it. Love between the common people was more free. Ernst had also witnessed this with his own eyes in those few months he had spent at the villa. There were male companions, female companions, and also lovers for only a few days. That’s right, those people had all freely loved, and Ernst had also become just as free as everyone else. Freedom, what a great word that was. Ernst looked out the window of his office. Here, there was no tall fence to obstruct his view, and he could see the enormous forest spread out over the distance. If Ernst wanted to do so, he could even go and run over to that forest as he pleased. Even now, Ernst had never gone running before. Once spring came and the snow melted, he wanted to try running up to that forest. It was an idea that made his heart thump with excitement. Aah, no, wait. He had a much more urgent problem to think about than spring. That was, ‘falling in love’. What was it that the man had said? Right, he’d said that he wanted to stay by Ernst’s side. Ernst had been happy. There was someone who had said to him that they wanted to stay with him. Was this what it meant to be in love, he wondered. No, that wasn’t right, was it. Ernst recalled his memories of those faces that he would be able to recognize, even now. If those three hunters had told him that they wanted to stay with him, he would also be happy. If the villa’s butlers and maids said it, that would also make him happy. This feeling wasn’t how it felt to be in love. At some point, it became time for lunch. He blankly ate the same thing he had eaten in the morning. He kept thinking it over until his head felt like it was going to burst. He wished he could separate it from the neck up and just leave it somewhere. There was nothing he could do cooped up in his office, so he went to take a walk inside the manor. On second glance, it was a shabby mansion. Bare stone walls without any wallpaper spanned the corridors. Here and there, the eaves of the roof were broken, letting some snow blow inside. Couldn’t they fix it? Even though he was inside the mansion, Ernst wore a heavy cloak as he walked. Had it always been this lacking, or had it only been dirt before? This shabby mansion’s only benefit was its spaciousness. Even after walking for a long time, Ernst hadn’t come across any butlers or maids working here. It seemed like they had limited the areas where they worked. The servants in Meissen were extraordinarily pragmatic, he found. A fine, authoritative voice drifted over on the wind. Ernst walked down the corridor, then looked out a window. The militiamen were training. No, to be more precise, the stern-eyed commanding officer and that Dunbertian were sparring. As expected of the leader of the militia, the officer’s movements looked sharp and fast to Ernst’s eyes. But he wasn’t a match for a natural-born warrior, and the Dunbertian easily sidestepped him. Soon after, the other militiamen who had been watching from the sidelines stood, and they turned their swords on the Dunbertian. Though the commanding officer tried to stop them, they didn’t hear his order, and a large number of people dashed forward. Without even realizing it, Ernst rushed toward him. All he could think was that even if the man was Dunbertian, there was no way he wouldn’t be hurt when fighting against that many people. But then, the way the Dunbertian held himself changed – just as that thought passed through Ernst’s head, the Dunbertian evaded all of the swords pointing toward him, and he stood in the place the militiamen had just left. Some of the militiamen let out sounds of amazement. Ernst was so relieved that he carelessly patted his chest and gazed at the man in admiration. That enormous body was capable of making such vivid movements. After that, the frustrated militiamen who wanted to fight again, along with the militiamen who thought it would be amusing and pulled out their swords, together formed twelve opponents who faced the Dunbertian. Yet in the end, not a single person was able to land a hit on him. Amidst the exhausted Kleber who collapsed to the ground, the Dunbertian alone stood without losing a single breath. This hasn’t been apparent in the translation, but all this time, whenever Ernst refers directly to another person (usually his servants), he uses the word 者 (mono) rather than 人 (hito). Though both words mean ‘person’, 者 is also a homonym of 物 (mono), which means ‘thing’. 者 is used mainly in formal situations; it seems to denote a lowered status, so people may use 者 to refer to themselves in order to be polite/humble, while a superior may call others 者 to show they have higher rank. In this particular sentence, Ernst says “人はモノ” or ‘[In the royal palace,] People are things’. It’s implied that he now understands that people are living and breathing beings that he can feel connected to. After leaving the royal palace, he has learned that others aren’t ‘things’, they are ‘people’. Maybe it was another rule that in Meissen, all three meals consisted of the same thing. In the morning and at noon it was always the same soup as ever, and dinner was soft baked bread. The same as last night, the head butler glanced at Ernst as if telling him to ‘Quickly go to bed’, so Ernst found himself in front of the hearth in his own room. Letting out a sigh of relief at the warm fire, Ernst sat in a chair. The candle they had given him was short. Was this to tell him to go to bed before the candle went out? Snow blanketed the earth; the night was quiet. Ernst wondered if everyone in the manor was asleep. He had thought that normally, if the lord of the manor was awake, then all of the servants would also stay awake, but it seemed that things were different here. First, he should try to follow the way the people of Meissen did things, Ernst thought. Ernst heard the sound of a hesitant knock at his door. Easily pushing open the heavy door, an enormous man nervously entered the room. Ernst silently pointed toward the one other chair in front of the fireplace. Looking up at Ernst from his lowered face, the man sat in the chair. His large body was unable to fit in it, so he sat with his buttocks hovering over the seat, his body squeezed to take up less space. But of course, it wasn’t the chair’s fault. Ernst glanced at the large man from the side of his eyes. The man’s large body flinched. That large body grew stiffer and stiffer. The man nervously opened his mouth. The sight of those large hands tightening on themselves caught Ernst’s attention from the corner of his eyes. The large man currently cowering before Ernst was that very same manservant who had served in the bathing chamber. He was a person of the courageous Grude race, the Dunberts. It was hard to believe that this figure who was so tense under Ernst’s questioning was supposed to be of such fearless character. Those who desired to govern the kingdom, or otherwise those who desired power and authority, would no doubt cling to their social status. Ernst didn’t know which he was, but it seemed that he himself was an obstacle, he thought. When Ernst thought over his situation, it was easy to guess that somewhere out there, someone was trying to ostracize him. So it seemed like this large man hadn’t come here to kill him, Ernst guessed. After all, there was no way an assassin would stand out this much. This overly large body wouldn’t be able to hide anywhere. In that case, what was he doing for him to be in a place like this? In Ernst’s chest, a single light flickered to life. He turned his delicate body slightly towards the large man, waiting for the Dunbertian’s words. With his head lowered, the words this large man whispered made Ernst feel a swooping sensation. In that palace, in that cold palace where Ernst had not formed a single connection to another person, there was someone who had missed and yearned for him. Of his own free will, he had chosen to follow Ernst even in the face of the dangerous forest and steep cliff faces that Ernst had crossed. Overturning his chair in his haste to stand, Ernst grabbed the large man’s hand. It was a warm, faithful hand. The large man raised his head. For some reason, his reddish-brown eyes held some distress. The swelling delight within Ernst deflated. His large hand grasped Ernst’s and squeezed. His grip was tight and powerful. The large man painfully spit out these words. Everyone had sought out Ernst’s value as the Crown Prince. There hadn’t been anyone who wanted to follow Ernst when he had lost everything. They each had their own lives, and they lived steadily in the place they had rooted themselves to. Ernst was just an existence that passed by between them. A faint existence. Yet this giant man had thrown everything away, and he alone had chased after Ernst. Ernst did not know any joy greater than this. The giant man violently shook his head. Pain rose within those reddish-brown eyes as they stared at Ernst. He didn’t know exactly why, but Ernst felt that this man was pitiable. I thought these chapters would take longer to translate, but I was eager to find out what happened next. This chapter might actually be the first time we see real dialogue in this story. Before, all of the dialogue was narrated through Ernst’s thoughts. This is the last chapter I read through MTL. From here on, I’ll be discovering the story while translating. I’m looking forward to finding out how Ernst will work to improve Meissen, and just what exactly is going on with the Dunbertian manservant! By the time Ernst arrived, the mansion was shrouded in darkness. In Meissen, which was located in the north of Rintz, night fell quickly. Noticing the sounds, a middle-aged man exited the manor. At first glance, Ernst thought he was the head butler, but upon seeing the careless way the man carried himself, he began to have doubts. The man greeted him whilst biting his own tongue. He really was the head butler. Ernst felt a touch of anxiety. After a hundred years passed without a Lord to rule it, it seemed that Meissen had lost all of its ways. Before Ernst came here, were these people the same as the rest of the population, living their lives by plowing fields and hunting? Though the curtain of darkness had fallen quickly, the night was still young. But after Ernst finished eating what was considered a full meal to them, he was encouraged to immediately head to bed. Though it had been a long journey, and he was certainly tired, was he supposed to go to sleep without taking a bath? Ernst was puzzled as he thought this, but when he told them that he wanted to take a bath, they looked back at him with perplexed expressions. The royal palace did as the royal palace did, the villa did as the villa did, and Meissen did as Meissen did. Ernst paid respect to the way they did things and went to bed early. That day, the sense of relief he had from safely reaching the mansion pulled him into a dreamless sleep. The next morning, he woke early. Apparently, ‘early to bed, early to rise’ was a rule. There was no fire in the hearth, and Ernst shivered in the cold as he changed his clothes. Perhaps there was also a rule that the fires would only be lit in the fireplaces when it became night. At the dining table, he ate a simple meal. Thin soup and hard bread. There wasn’t a single piece of fruit or a sip of tea. He drank hot water. Once he’d settled in, Ernst met with the servants of the manor face-to-face. There were two butlers and three maids, and there was also one cook. As well, there was only the single head butler. There were less servants here than at the villa he’d stayed in temporarily. Meissen was a remote region – or rather, a border region. Though the three Schell countries were friendly on the surface, they were by no means neighbors who would always trust each other. Meissen was, at the moment, the front line against Lux Kingdom should they ever come to war. Naturally, it should have a militia within. So was this supposed to be that militia? Ernst felt out of his mind as he looked down at himself. All of the villagers he had seen yesterday were the same – shabby and thin men who stood around aimlessly. Would those people be able to fight; would they be able to win against an enemy? In the first place, would they even be able to wield a sword? Ernst went to talk with the man who was considered the commanding officer. He was a man with arrogant eyes. He had a good physique for a Kleber. This man seemed to be the only soldier here. Yet, he carried a kind of atmosphere which said that in the event of an emergency, he would go anywhere. Ernst gathered the militia in the much-too-small inner courtyard of the mansion. There were also people hidden by the walls of the residence. Hiding his inner dismay, Ernst slowly walked through the mansion, looking at and memorizing each face. He made his way to the back, and just as he turned around, his feet stopped. Capturing the gazes of the militia men still hidden by the walls of the manor, Ernst’s thin legs froze. The distance between the village at Meissen’s outskirts where Ernst had parted with the hunters and the manor of the feudal lord took about half a day’s worth of travel via carriage. When he compared it to the smallness of the royal capital’s territory, Ernst understood just how vast Meissen was. Ernst stopped the butler who wanted to hurry and bring him to the mansion, saying that he wanted to take his time to look around. Though it would be impossible to check out everything, Ernst wanted to at least view the villages scattered along the way to the mansion. To begin with, Ernst asked who was the head of this village. The person the villagers all glanced at came forward; he was an old man whose legs were so unsteady, it wasn’t certain whether he could walk on his own. Was this kind of person really fit for the job? Ernst furrowed his eyebrows. When he looked it over carefully, he couldn’t find any men who looked like strong workers or breadwinners in this village. There were old men, women, and strangely enough, many children. This was the first time Ernst had ever seen someone else who had Kleber’s disease. There were very few people who developed it in the royal capital. They lived in the lower city surrounding the capital. But more frequently, in poverty-stricken lands far from the capital, such as Meissen, one would find many people with Kleber’s disease. There hadn’t been enough time before Ernst’s departure, so while riding his carriage out of Rintz, he had read some information that he had hastily sent for. In Rintz Kingdom, the average rate of occurrence of Kleber’s disease was 1 in 100. Yet in Meissen, that rate became 1 in 20. Though they had Kleber’s disease, not everyone was like Ernst, who was unable to sire children. Rather, it was considered unusual to be like Ernst, who was entirely a child. Ernst once again looked over the villagers. These were people who were said to have Kleber’s disease. In this village, the rate of occurrence of Kleber’s disease was 1 in 10, no, 1 in 5, wasn’t it. A sudden thought occurred to him, and Ernst asked the village head for his age. This year he had turned 147, he answered. These words stunned Ernst. The average lifespan in the Schell continent was 200 years. Rintz Kingdom was comprised primarily of Kleber people who were, of course, one of the races of Schell, so their average life expectancy was 200 years. No matter how Ernst looked at him, the old man in front of him seemed like he should be somewhere from 190 to 200 years old. Normally, a 147-year old should still be good to work, and their lower half should still be more than strong. So why did he look like this? Did he have some other disease? Feeling like the questions in his mind had gone unanswered, Ernst unwillingly moved on to the next village. This village was in the same state. There were many people with Kleber’s disease, and there were only elderly villagers with not a single person in their prime. Nothing changed in the next village, either. When the mansion was in sight, Ernst asked the butler what the average lifespan in Meissen was. The butler only shook his head. “I don’t need an exact number – how old?” Ernst asked again, but the butler just titled his head away. Why does he have to keep shaking his head so much, Ernst thought, a doubtful feeling rising within him. The butler trembled nervously as he asked a question. What is an ‘average lifespan’, he asked. Ernst was stunned in disbelief. It couldn’t be that a butler who worked at the manor wouldn’t even know something like this. Then, he suddenly recalled something. When comparing the countries in Schell continent, including the Luxe and Silus Kingdoms, the literacy rate of the Rintz Kingdom was clearly lower than the other two. The disparity between classes was clear; along with the nobles and wealthy merchants, only 1 in 5 people among the commoners was able to read. But in Meissen, this rate was possibly even lower. A butler who served the manor shouldn’t possibly be unable to read, but his behavior roused Ernst’s suspicions. The materials that Ernst had hastily gathered only briefly listed some details regarding the neighboring Lux and Grude territories. For 100 years, no one had ruled this land. Ernst watched the scenery from the window of the carriage. The bright red sunset illuminated the distant reaches of the snowfield. This was the last night Ernst would spend with the hunters. After walking for one more day, they would reach the outlying village of the Meissen territory. There should be a welcome party for him in the manor of that village. The hunters would part with him from there. Even though Ernst had said that it would be fine if they at least rested for a day at the manor, the hunters politely declined. Winter was growing deeper and deeper. If they delayed their departure for even one day, the valley might close on them. The snow seemed to be falling more heavily this year. After passing through the valley, they entered Meissen’s forest. They lit a fire with the drywood they collected here and there. The forest within Meissen’s territory was quiet. Here, the land, the people, and the beasts were all barren and starving. In this forest, there wasn’t a single sign of a living creature. They spoke quietly while drinking warm tea. Ernst listened to the hunters’ stories, and he in turn told them stories of his time at the villa. When they heard about how Ernst had been tricked by the butler’s tale of the wolf, the hunters’ grim faces broke out into smiles. When they got along like this, it made Ernst feel regretful over how they would have to part ways. But it wasn’t as if he could ask them to come along with him. After all, these men lived their lives as hunters. Ernst told them that he wanted to apologize for the horse they lost. He also wanted to thank them for safely bringing him to Meissen. Yet these things were also firmly refused. They couldn’t receive more compensation than what had already been decided, they said. They drank tea and began preparing to rest. Today, too, the hunters switched off on fire-watching duty between themselves. The four of them had overcome their obstacles. They chatted about various things. It didn’t feel as if, by tomorrow night, they would all be gone. They walked through the forest. The trees in Meissen were wide and tall. It sure would be hard to chop these down,said the hunters, who also worked as lumberjacks. Was that so? Ernst had thought that it would be better if the trees were large, but it seemed that it wasn’t good if they were too large. Moreover, it was even difficult to find trees for firewood. When Ernst asked why that was, the hunters answered that there wasn’t any deadwood in this forest. Along with that, last night, they had only found enough firewood to fuel a fire for one night despite how long they had searched. Something moved between the trees. The hunters’ feet stopped. They covered Ernst, who stood at the back, and gazed into the depths of the forest. Even to Ernst’s eyes, the sight of this deer with its enormous horns was eyecatching. They stared at this outstanding deer. It was incredibly large. The hunters let out murmurs of amazement. Though where they were bordered Lux Kingdom to the north, it also bordered Grude to the east, so the animals were quite large, weren’t they? the hunters said. A map of Meissen’s territory drifted through Ernst’s head. Certainly, if you kept walking east, you would reach the land of Grude. There, you would find Grude Country, a land which existed solely for the purpose of trade. Grude Country was located in the approximate center of the Grude continent, and it was said that the rest of the land was filled with dry rocks and reddish soil. That large man of the bathing chamber belonged to one of the four races which lived in Grude, the Dunberts. All four of the races of Grude shared enormous and sturdy physiques. The animals which dwelled there were also larger than could ever be imagined in the Schell continent. The deer had stared fixedly in their direction, then turned its body and leapt away. If we’d brought that deer down, it would’ve made for a fine meal, the youngest hunter said. With that size, it would’ve been a pain, the eldest hunter replied. When Ernst asked why, the hunter explained that it was too big to be brought down by the arrows used in Schell. Then why not use a knife or hatchet? Ernst once again asked. Even if they did, with a beast that big, it was impossible to even get close to it, the hunter explained, then shook his head as if trying to let go of his own reluctance. In the distance, they heard the sorrowful cry of a wolf. Even those wolves wouldn’t be able to bring down that deer, the hunters muttered, showing a trace of sympathy. The forest wasn’t withered of life. Yet what abounded within it was the frustrating feeling of being unable to grasp that which was right before your eyes. The village was bleak and desolate. The welcoming reception from the manor consisted of solely one butler. The villagers who unsteadily crept out from their dilapidated shacks all wore clothing that looked rough and chafing. Even though the people of Schell continent were strong against the cold, they still wouldn’t walk around like that in a place like this. They were thin and emaciated, and their limbs looked like sticks. Ernst had unconsciously frozen still. One of the hunters softly pushed his back. Ernst suddenly remembered to walk, and he went to thank the butler who had come to greet him. Well then, the hunters said, about to leave. Ernst hurriedly rushed to hold them back a bit. He expressed his thanks to them, and for the first time in his life, he lowered his head and bowed. Though the hunters, the butler, and the villagers were stunned, Ernst’s bow had come naturally. The hunters had brought him through such an arduous journey; just bowing his head once wasn’t enough of a sacrifice to pay them back for everything. He raised his head and saw the faces of the hunters. He looked at each and every one of their faces, wanting to carve into his mind the memory of what they looked like, and then he shook the hand of each of them to say goodbye. They had bulky, rough-skinned hands, those warm hunters. After arriving safely at the hut, Ernst rested there for one day. The hunters living at the hut welcomed him with some warm soup. Though they noticed the horse was missing, they didn’t mention it. Ernst laid down so that he could recover the energy it would take to safely cross the valley. Though his body felt very tired, his mind didn’t feel any better, either. Even so, he wasn’t able to fall sleep. What they did was the right thing to do. If they hadn’t sacrificed the horse, someone might have died. No, maybe all of them might have died. One horse was enough to satisfy a pack of wolves. If that hadn’t been the case, Ernst wouldn’t have been able to escape on foot. He couldn’t stop thinking about those days he spent swaying on the back of the horse. He had been told that as king, he shouldn’t hesitate to sacrifice one or two people for the greater good. He should always unhesitatingly choose the good of the country over the lives of a thousand citizens. Ernst, also, had believed that this was the way of an admirable politician. But now, faced with the sacrifice of just one horse, he knew he would never be able to do such a thing. He had really… become so weak. No, that wasn’t right. In that cage called the royal palace, he had just lived without knowing anything. Something like ‘living’, and something like ‘dying’, he didn’t understand either of them. For that reason, as life held no meaning to him, it was simple to throw away the lives of his people whilst debating what should be done. The valley was more difficult to cross than the forest. It didn’t have any wolves. It didn’t have any other dangerous animals to replace the wolves, either. It was the terrain itself that was dangerous. In the summer, it was said that this place was rocky. But the scenery laid out before Ernst’s eyes was one vast, white surface. Below the white snow covering the area were countless unstable rocks. The hunters carefully searched for footholds to move forward. Now that they had exited the forest, there weren’t any trees to block the wind from blowing directly on them. Ernst’s small body was about to be blown away, so one of the hunters tied Ernst to himself with a rope. As they went forward, the amount of ground they could walk on lessened. The path narrowed, making the cliff seem like it was getting closer. Three days after they started walking, they approached the most treacherous part of the valley. Will we be able to get through this place safely? Ernst wondered, his body shrinking in fear. The hunters took one day of rest before heading to that area. They used cloth, branches, and snow to ward off the wind. Using the lumber they’d brought from the hut, they stoked a fire. They melted some snow, and for the first time in three days, they were able to have a hot drink. They added tea leaves and ate some of their treasured butter in order prepare for tomorrow and build up strength in their bodies. The next morning had fine weather. The wind also wasn’t very strong. Ernst felt relieved; he thought that it would be easy to cross from here on, but in contrast to his thoughts, the hunters had gloomy expressions. When the weather was good, the temperature would rise, and it would be easier for the snow to melt. But of course, it would still be easier to walk than if the wind were blowing. Winter still hadn’t passed over the entryway to Meissen. They had no choice but to hurry and get out of here while they still could. The youngest hunter proceeded first. He carefully searched for footholds. He grasped at the rocks with both of his hands. Ernst watched him with intense concentration. He couldn’t afford not to do so. If Ernst missed his footing, he would fall into the cliff on the other side. You couldn’t see the bottom even if you peered down. With the depths of hell at his back, Ernst had to be able to walk on his own because no one would be able to save him if he fell. Ernst was the second to go. The eldest hunter had fastened a rope around Ernst’s stomach, then tossed the rope toward the crossing hunter. After confirming that the other person had tightly grasped the rope, the hunter urged Ernst forward. With a nervous expression on his face, Ernst nodded and began to walk. He believed in the three hunters. He followed the footsteps of the hunter who had crossed before him. His fingers gripped the cliffside. He felt like his bulky gloves didn’t have much use when it came to this. As best as he could, Ernst put all of his strength into sticking his fingers to the rock. Slowly, carefully, he inched his feet forward. Because he wore the winter clothing, he couldn’t see his feet. When Ernst leaned slightly back to get a better look, the voice of the senior hunter rang out. Move forward by searching out the next spot with the tip of your foot, he said. Ernst hastily pulled back his neck. He was right; even though Ernst had only leaned back a little, the gust of wind coming from below had destabilized his body. He couldn’t just rely on his eyes. He concentrated all of his senses on his feet, and as if fiercely trying to get his shaking fingertips to settle, he applied more strength to them. He let the vast scenery behind his back fade from his consciousness. His eyebrows were frozen because of the cold. Ernst slowly advanced, and as he glanced up, his gaze collided with the serious expression of the hunter carrying the rope. Regardless of whether they had been hired by Ernst, regardless of his status as the former Crown Prince, they all felt that they wanted to safely get out of here together. Ernst boiled with energy that bubbled up from the depths of his body. Ernst took twice as long to cross as the hunter leading the way. On Ernst’s last step, the hunter who had watched over him gripped him with his powerful hand. As Ernst fell over, the hunter firmly hugged his small body. He patted his back as if praising him, Well done. Ernst felt more proud than when he had solved a difficult formula in the royal palace. The two remaining hunters also safely passed through. Once again, they walked in a group of four. Just because they had crossed the hardest spot didn’t mean that the rest of the path in front of them would be easy. They had to climb both crumbling rocks and frozen stone surfaces. It was hollow beneath the snow, putting them in danger of falling in. But because the three hunters accompanied him, Ernst wasn’t afraid. Day by day, step by step, Ernst felt like he was growing stronger. He felt like he was learning, for the first time, how to trust in other people. It had been inevitable that of all the people in the royal palace, no one had felt sadness or regret over his leaving. Ernst didn’t know the name of a single person living in the royal palace. He didn’t even know the name of the head butler who had accompanied him since birth. Even if he didn’t know, it didn’t matter. Though he didn’t know their names, the only things they spoke were instructions. There wasn’t any trace of affection in them. So that’s how it was, Ernst realized. Ernst didn’t even know the names of the people who’d lived in the royal palace. When he thought about it, that giant man had been the only person whose name he had wanted to ask. Hello! Thank you for reading the latest update to the MotS translation!! The story continues a bit slowly for the next few chapters until Ernst settles into Meissen, so I’m going to wait and release them as a batch update. 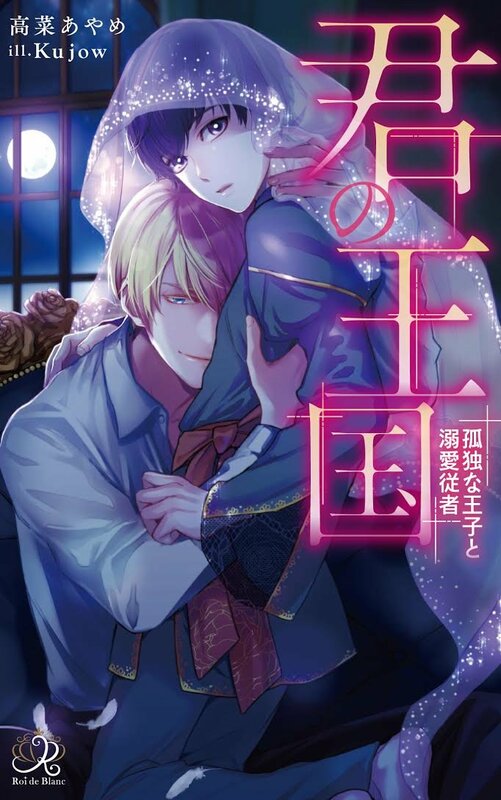 Also, if you haven’t seen it yet, my friend Cael is also translating a new BL story on this website! It’s called Your Kingdom. Please check it out~! It’s about an innocent and sickly prince who is attended to by a mysterious angelic(?) man. I’ll try to keep working steadily. Thank you for enjoying the stories that these authors have lovingly crafted!! Welcome to our translator Cael!! Hehehe! Ars here! Very excited to announce that my friend Cael has started translating the story Your Kingdom by Takana Ayame! Cael is the translator of several Japanese stories including Herscherik (Reincarnated Prince Series), Ashes and Kingdoms, and The Sorcerer King of Destruction and the Golem of the Barbarian Queen! Cael helped me countless times when I first started translating. This is their first time translating a BL story, and I welcome them with open arms!!! Please check out the other stories they’re working on should they catch your eye~ You can visit their website here! Let’s give Cael a warm welcome~ And thanks to everyone for enjoying our BL translations! We’ll continue to work hard! Posted on April 14, 2019 Author arsCategories AnnouncementTags Announcement3 Comments on Welcome to our translator Cael! !